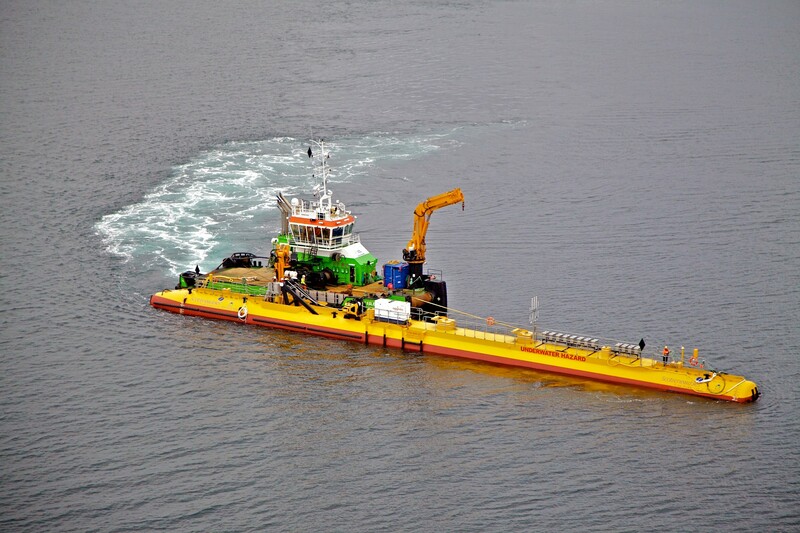 Orbital Marine Power [formerly known as Scotrenewables Tidal Power Ltd] is an innovative Orkney based engineering company focused on the development of a tidal energy turbine technology with the potential to produce a step-change reduction in the cost of energy from tidal currents. Founded in 2002 the company's design philosophy was to develop a turbine with low manufacturing, installation and maintenance costs. This resulted in a unique floating turbine with retractable rotors allowing it to be easily towed to and from site with small, locally available vessels. Following on from the success of their SR250, a 250kW prototype, Orbital launched a 2MW turbine in early 2016, known as the SR2000, the culmination of more than 12 years of research, design and testing. The world's most powerful tidal energy convertor has achieved several world firsts for tidal stream turbine technology generating in excess of 3GWh of electricity during its first full year on site, the highest ever produced by a single marine energy prototype in Scotland. They currently have a team of 26 employees spread between Orkney and Edinburgh offices. Having secured a major funding package and appointed a new industry leading director Orbital are now preparing to commence build of their Orbital 02, the company's first commercial unit building on the success of the existing 2MW technology and featuring a number of innovations.